Cassini was the largest spacecraft ever sent to the outer planets, over 12,000 pounds at launch. It was two decades in the planning and construction before it was launched in 1997. It took seven years and several gravitational assists to finally reach Saturn in 2004. Along the way it flew by Earth, Venus, an asteroid and Jupiter. It explored Saturn’s complex system of moons, moonlets and rings for 13 years, in a choreograph of almost 300 orbits encompassing 162 targeted moon flybys, including 127 flybys of Titan and 23 of Enceladus. And it sent the Huygens probe to Titan’s surface. Cassini traveled almost 5 billion miles, and collected and sent back to earth from over one light hour away, more than 635 GB of data, including more than 450,000 images. Cassini discovered 6 new moons of Saturn, an underground ocean and geysers on Enceladus and methane lakes on Titan, to name just three discoveries. The data from its 12 instruments has provided the basis for more than 6,300 technical papers. Among the most successful deep space missions ever carried out, Cassini revolutionized our understanding of Saturn, planetary dynamics, and the possibilities for life in the solar system. The five lectures in this program will convey some of Cassini’s rich history, its engineering and what we now know about Saturn, its rings and its moons, especially Enceladus and Titan. The lectures also will touch on the possibilities for life to have evolved on Enceladus and Titan, and on future missions back to Saturn to look for it. The Cassini spacecraft was the largest outer planetary spacecraft ever built. The Huygens Probe, carried by the Cassini spacecraft to Saturn, was the first spacecraft to land on Titan. The Cassini/Huygens spacecraft took almost fifteen years to get approved, designed and built, before it was finally launched on October 15, 1997. It then took seven years to get to Saturn, with gravitational assists from Venus, Earth and Jupiter. Cassini spent thirteen years at Saturn, and the information it sent back to earth revolutionized understanding of the Saturnian system, changed our views of planetary dynamics and opened up vast new possibilities for complex systems around the planets of other stars. 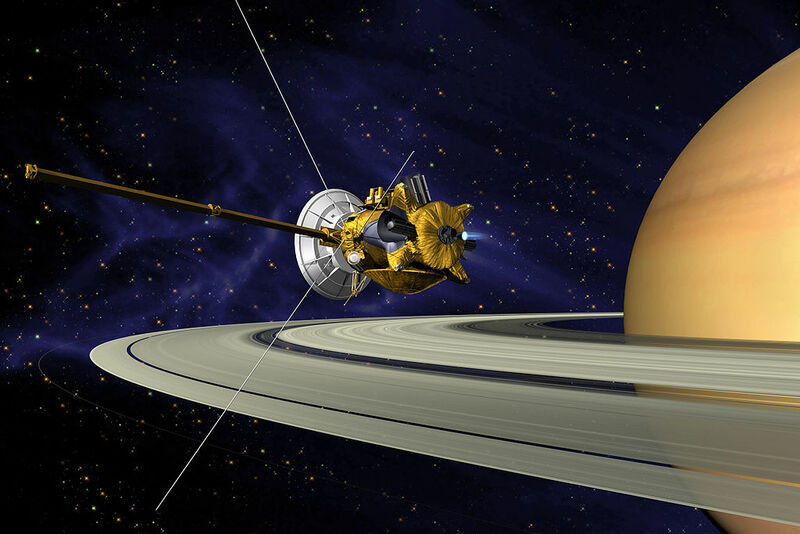 This lecture will describe the engineering design, build and test of the Cassini spacecraft and Huygens Probe, and engineering and navigation challenges of Cassini’s twenty year mission. Julie Webster is the Manager of the Cassini Spacecraft Operations Office and concurrently serves as Chief Engineer of the Juno Mission to Jupiter. She has been at JPL for twenty-five years. Her interplanetary spacecraft experience has been primarily in Mission Operations on Magellan, Mars Observer, Cassini, and now the Juno mission at Jupiter. Prior to working at JPL, Julie was with Martin Marietta Astronautics, where she did system test engineering, assembly, test and launch operations, and flight operations for several spacecraft, missile, and launch vehicle programs. Among other honors, Julie has been awarded two NASA Exceptional Service Medals and a NASA Exceptional Achievement Medal for her work on Cassini and Magellan. This lecture will provide a brief summary of Saturn’s system, Saturn itself and Saturn’s beautiful rings. The focus of the lecture, however, will be on Cassini’s finale, when, still operating, it plunged into the planet returning the closest observations of the its rings and of Saturn’s atmosphere. The lecture will describe what went into the scientific planning of this final phase of the mission and some of the unique science relating to Saturn and its rings that was accomplished during this period, including the highest-resolution images and spectra ever obtained of the rings and associated small satellites, as well as in situ sampling of the ring environment and the planet’s upper atmosphere. Phillip Nicholson is Professor of Astronomy and Acting Director of the Center for Astrophysics & Planetary Science at Cornell University. He is a member of the Visual Infrared Mapping Spectrometer science team on the Cassini mission. Previously he led the Cornell – Caltech team studying the impact of Comet Shoemaker-Levy 9 into Jupiter using the Hale Telescope. Phil’s research centers on two main areas: the orbital dynamics of planetary ring systems and natural satellites, and infrared observational studies of planets, their satellites, and their rings. His work has included studies of the rings of Saturn, Uranus, and Neptune using Voyager, Cassini and ground based observations. In the course of this research Phil and colleagues in the US and Canada discovered numerous outer satellites of Uranus, Saturn and Neptune. Phil is an author on numerous technical publications and he coauthored several review articles on planetary ring dynamics and on the Uranian and Neptunian ring systems. He has served on many committees serving the astronomy community and as Editor in Chief of the Planetary Science journal “Icarus” for 20 years. Saturn possesses a unique family of moons. Besides the ” garden variety ” collection of icy, round moons that move in regular orbits, there are weird moons that skirt and confine the massive rings of the planet, moons that are embedded in the rings themselves, and other moons that look like sponges and painted snowballs. Two of Saturn’s moons even exchange orbits every 4 years‐a sure bet that they were once the same object and were split apart by a massive impact. Far from the planet itself, there is a swarm of smaller battered moons, believed to be captured objects from the outer Solar System. Many of Saturn’s moons have subsurface oceans that harbor potentially habitable environments. The 13-year exploration of Saturn’s system of moons by the Cassini spacecraft gave an intimate view of all these wonderful worlds, and set the scene for future exploration. Bonnie Buratti is a Principal Scientist and technical manager at NASA’s Jet Propulsion Laboratory, with expertise on the structure and evolution of icy moons and other small bodies. She is currently serving on the Science Teams for both the Cassini and New Horizons missions, and she is also the NASA Project Scientist for the Rosetta Mission. Among other honors Bonnie was awarded the NASA Exceptional Achievement Medal and the Carl Sagan Medal of the Division of Planetary Sciences of the American Astronomical Society. Bonnie is a Fellow of the American Geophysical Union. The International Astronomical Union named Asteroid 90502 Buratti after her, in recognition of her many contributions to planetary science. She is an author on over 200 scientific papers and her first book – “Worlds Fantastic, Worlds Familiar: A guided tour of the Solar System” – was published last year. Enceladus is a small moon of Saturn with a radius of just 250 km. Yet this small moon has redefined our understanding of cryovolcanism in the Solar System. This moon should have cooled after its formation, yet tidal heating has allowed a liquid ocean to remain present in its interior. This ocean is venting material through fractures in its south polar region. This lecture will describe the amazing geology of this moon and how tidal forces affect the cryovolcanic conduits that erupt water ice onto its surface and into space. The presence of liquid water makes Enceladus one of the best locations in the solar system for life to exist. And the material erupting from its surface is a direct sample of the ocean material deep within its interior. Thus Enceladus not only is one of the most intriguing places in the Solar System where life might exist, we also now know a way to look for it by sampling the icy plumes, without having to intrude on the moon itself or penetrate its surface. The technology and mission concepts to search for signatures of life have been developed and, hopefully, we will be sending them to Saturn on a mission to seek out signs of biology, perhaps different life on Earth. Terry Hurford is a planetary scientist in the Planetary Geology, Geophysics, and Geochemistry Lab at NASA Goddard. His research is focused on icy satellite geology and geophysics, the effects of interior structure on tidal deformation and surface stress, the effects of orbital dynamics on tidal stresses, the influence of tidal stresses on the formation of tectonics on icy satellites, and the influence of tides in the eruptions of plumes on Enceladus’ south polar regions. He earned a BS in Astronomy and Physics and a PhD in Planetary Science at the University of Arizona. Is It Brewing the Seeds of Life? Titan is Saturn’s largest satellite and it is the only moon in the solar system with a substantial atmosphere. Like the Earth’s atmosphere, the major component of Titan’s atmosphere is nitrogen. Unlike on Earth, however, the remainder of the atmosphere on Titan is methane, rather than oxygen, water and carbon dioxide. Sunlight and electrons reaching Titan’s upper atmosphere initiate a chain of chemical reactions, causing the methane and nitrogen to fragment and recombine into larger and more complex molecules, eventually forming smog particles large enough to shroud the moon in a thick orange haze. This talk I will review our knowledge of Titan’s atmosphere at the end of the Cassini-Huygens mission, and show how it resembles the conditions in the Miller-Urey experiment, designed to replicate the early atmosphere of the Earth. The lectures will discuss the possibility that similar molecular have formed on Titan and that Titan might even be harboring life, perhaps different from that on Earth. The lecture will conclude with a discussion of what we still need to know to see if Titan in brewing life – or that life exists there – and why we need to return to Titan to truly answer these questions. Conor Nixon is a planetary scientist at the NASA Goddard Space Flight Center. the Deputy Principal Investigator on Cassini’s Composite Infrared Spectrometer (CIRS), which he helped to design, build and test. In fact, Conor began working on the CIRS as a graduate student at the University of Oxford, in 1995. He joined NASA in 2000 to continue this work. He was named Co-Investigator for the CIRS in 2007, and then CIRS Deputy Principal Investigator in 2012. Conor’s uses data from the Galileo Mission Near Infrared Mapping Spectrometer, the Cassini CIRS and other facilities to model infrared emission spectra to learn about the composition and distribution of molecules in the atmospheres of Jupiter, Saturn and Titan. In addition to other awards, Conor is the recipient of seven NASA Awards for Cassini Science and Operations, including the Robert H. Goddard Award for Exceptional Scientific Achievement. He earned a BA in Physics at the University of Cambridge, an MS in Astronomy at the University of Manchester and a PhD in Planetary Science at the University of Oxford. Conor grew up and attended school in Belfast, Northern Ireland, before entering college. On June 15, 2018, President Larry Millstein called the 2,394th meeting of the Society and 87th Joseph Henry Lecture to order at 7:43 p.m. in the John Wesley Powell Auditorium of the Cosmos Club in Washington, D.C. He announced the order of business, that the evening’s lecture would be livestreamed on the internet, and welcomed new members to the Society. Vice President Mark Clampin then introduced the five speakers for the evening, representing NASA’s Cassini mission to Saturn: Julie Webster, Phillip Nicholson, Bonnie Burati, Terry Hurford, and Conor Nixon. Julie Webster is Manager of the Cassini Spacecraft Operations Office and Chief Engineer of the Juno Mission to Jupiter. Webster said that after the first missions to fly by Saturn, Voyager 1 and Voyager 2, both launched in 1977, scientists pursued an international collaboration for a dedicated return mission. That effort resulted in the 1997 launch of the Cassini Saturn Orbiter and Huygens Titan Probe. Cassini carried a 4-meter-long antenna, 4 cameras, and 12 instruments, all of which ran on only 850 watts at launch. Over its seven-year journey to Saturn, Cassini relied on gravity assistance from Venus, Earth, and Jupiter. Once in orbit, Cassini engineers became so proficient in using gravity assistance from Titan as to extend the orbital mission from four to thirteen years. Ultimately, Cassini’s fuel depleted and it plunged into Saturn on September 15, 2017. Phillip Nicholson is Professor of Astronomy and Acting Director of the Center for Astrophysics and Planetary Science at Cornell University. Nicholson focused his lecture on Cassini’s final orbits through Saturn’s rings and through its controlled demise. Cassini took high-resolution images and spectra revealing details of the rings’ almost pure ice composition, density and bending waves in the rings, gap edges within the rings, and planetary oscillation modes inside Saturn. On its ultimate plunge through Saturn’s atmosphere, Cassini took samples of the atmosphere which are still under study. Bonnie Buratti is a Principal Scientist and Technical Manager at NASA’s Jet Propulsion Laboratory, and she served on the Science Teams for the Cassini and New Horizons missions. Of Saturn’s 62 moons, Buratti talked about the nine that she considers the “weirdest planets in the Solar System.” Among those moons is Iapetus, which looks like a painted snowball. Cassini solved the Iapetus mystery by revealing that dark patches on the moon were created by dust from Saturn’s outermost ring. Identifying a new mystery, Cassini observed unusual and unexplained red streaks across the surface of Tethys. Cassini also observed blue pearls on Rhea, potentially created by a collapsed ring around the moon. Spoke about Enceladus, an Arizona-sized moon inside Saturn’s E ring. In 2005, scientists determined that Enceladus is cryovolcanically active – spewing debris that scientists now believe provided the material to create the E ring. On a fly by, Cassini took high resolution images of Enceladus’s polar region of eruptions and surface fractures that experience a tension and compression cycle tied to the moon’s orbital period. Scientists believe these stresses are enough to cause the surface fractures themselves. The thickness of Enceladus’s water ice is unclear, and its interior contents are unknown. However, analysis of the moon’s volcanic plumes suggests there is a liquid ocean under the ice, which may support life. Conor Nixon is a planetary scientist at the NASA Goddard Spaceflight Center and the Deputy Principal Investigator on Cassini’s Composite Infrared Spectrometer. Nixon spoke about the potential for life on Titan, Saturn’s largest moon characterized by its dense orange atmosphere. Cassini flew by Titan 127 times, taking observations on each pass. Those observations showed that Titan’s ionosphere is predominately carbon-based, and that nitrogen and methane in the atmosphere react with sunlight to create heavy orange molecules that shroud the moon in a dense smog. Using spectroscopic detections, Cassini also revealed Titan’s complex molecular inventory that Nixon says may mirror that of Earth when life first formed. Cassini also collected evidence that, combined with observations from the Atacama Large Millimeter Array, confirmed the existence of vinyl cyanide – that reacts with methane to form into spherical membranes, which could lead to the development of life on Titan. After a question an answer period, President Millstein thanked the speakers, made the usual housekeeping announcements, and invited guests to join the Society. At 10:32 p.m., President Millstein adjourned the meeting to the social hour.